The Thunderbolts as a team were certainly an eclectic group, and managing these diverse members and their various allegiances was an uphill battle for Norman Osborn. But keeping his team happy was a secondary objective to Osborn's primary goal...arresting unregistered superhumans. 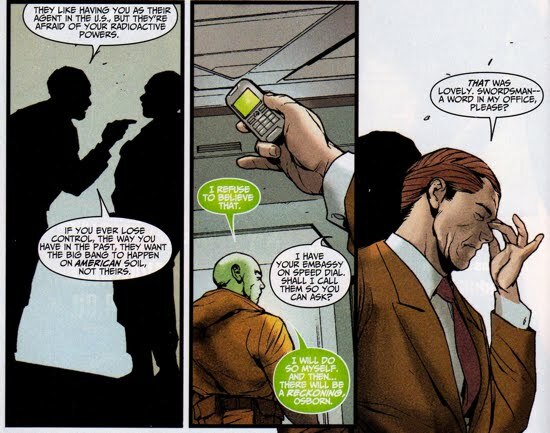 The Radioactive Man (aka Dr. Chen Lu), the Swordsman (aka Andreas Strucker), and their team-loyalties were the focus of the story featured in the one-shot Thunderbolts: International Incident. At the onset of the story the Thunderbolts battled a group of unknown superhumans that were robbing a Center for Disease Control in Atlanta, Georgia. Interestingly, the Thunderbolts had achieved a level of nationwide notoriety such that they found themselves the subject of a cable news TV show called Thunderbolt's Watch! The show's host, Tiffany Vasquez, was at the scene looking for more gossip involving the team but to no avail. The Thunderbolts succeed in their mission and arrest the thieves. As it turns out, the criminals were unknowingly experimented upon by the bioterrorist Arnim Zola. The villain's goal was give the dregs of society super powers, then use them as his slaves to carry out his bidding. Osborn soon extracted the necessary information from the captured thieves, namely the location of Zola's bases (Nigeria, Germany, and China). Osborn then briefed the team with their next mission, to preemptively strike against Zola and destroy his various bases whilst arresting him. 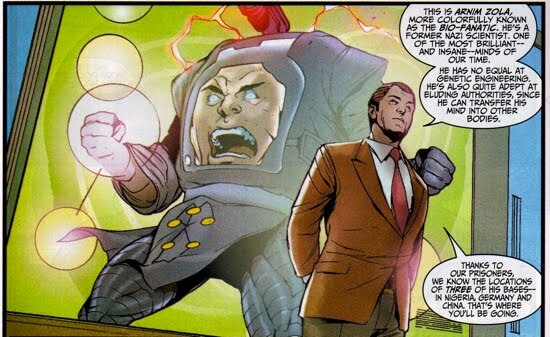 This provocative plan by Osborn led to a heated discussion between he and Radioactive Man who was adamantly against the Thunderbolts operating on foreign land without informing each country's government. The Radioactive Man was in a difficult position because despite being a member of the Thunderbolts, he technically reported to the Chinese government and thus experienced a conflict of interests with this directive. Osborn, rattled by Dr. Chen's insubordination, unveiled a very unsettling fact to the Chinese citizen, that his own country was afraid of him! Radioactive Man did not believe Osborn's claims and soon sought the advice of another Chinese super hero, the Collective Man. The Collective Man delivered the bad news that the Chinese Government did not want Chen back because they believed his powers to be too much of a liability. Feeling betrayed by his native government, Chen agreed to help the Thunderbolts with their foreign invasions. 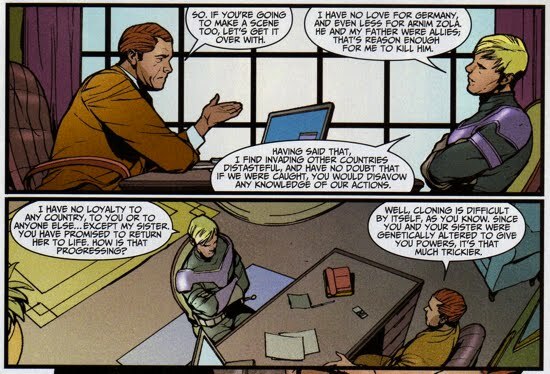 Covering all his bases, Osborn pulled The Swordsman (aka Andreas Strucker) aside and made sure that he did not have any problem with the invasion of Germany. 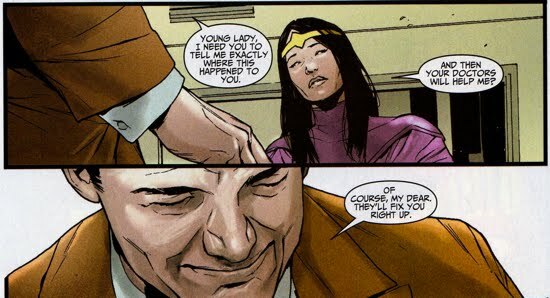 Strucker was fully onboard and did not think of himself as being a German. After finding Zola's headquarters in both Germany and Nigeria abandoned and desolate, the Thunderbolts were able to corner Zola in China. At Zola's base, the Swordsman split off away from his team, who were battling Zola's engineered monsters, and trapped Zola. But Swordsman did not bring him into custody, rather, he made a deal with Zola to let him go free in exchange for providing a clone of Strucker's twin sister. Strucker did not believe that Osborn was going to come though on his promise to clone his twin. Zola agreed to Strucker's terms, but soon the Radioactive Man barged in and nearly killed Zola. The angry Strucker threatened to destroy the entire base, killing everyone, if Chen did not go along with Strucker's plan to free Zola. The Radioactive Man reluctantly complied in order to save the innocent civilians and Zola escaped. It was abundantly clear that this team did not have much by way of team loyalty, loyalty to each other, or loyalty to their homeland.